We have created a toggle method that would allow you to enable the new Google+ Comments, but without losing your old Blogger commenting system. Users can continue to comment like they use to do in the past but Google Plus users can hit the “G+” toggle button and can comment, share and view the activity you post has had using that. What are the Disadvantages of Google+ Comments? First and foremost to use this feature, it is must that a person should have an account on Google plus otherwise he cannot leave a reply. Now not every single person on this earth is using this platform so this probably would annoy your visitors. Secondly, this commenting system depends upon the URLs. Unlike Facebook Application ID, it does no stores anything in your API. You would lose your all previous comments if you change the URL of your article or think about re-branding your domain. It does not send notifications to your Email Address whenever someone either leaves a reply to your blog or posts a new comment. On the other hand, all comments are published instantly without any review so it may become an ideal place for Spammers. Step#1: The first thing you need to do is to backup your template. After logging in, from the dashboard go to Template >> Edit HTML. Now enable the HTML Editor’s built-in search box and search for the following code. (Quick Tip: Click anywhere on the HTML editor and Press CTRL+F to enable the search box). Step#2: After finding the code mentioned above, replace it entirely and accurately with the Following code. (Remember: Make sure that the tags are properly closed otherwise you would face errors). Step#3: Now once again with the help of search box look for the following code. Step#4: After finding the code as prescribed above, replace it completely and properly with the Following code. (Remember: Try to close the tags properly, so the template does not catch any errors). Step#5: After applying the instructions as mentioned above press the “Save Template” button located at the top of your screen. Congratulations: You have successfully added Google+ commenting system to blogger without removing the previous blogger commenting system. By Enabling both commenting system, you are not forcing your users instead you are giving them the freedom to choose their most preferable platform. It does bring a lot of benefits to both you and your readers. Let us know what you think about the new tweak? Make sure to come back to this page if you come across any issues! Copyrights: We have added a Credit-back attribution is this gadget. However, if you have good reason to remove the credit then you have to purchase the premium version of this plugin. Just give us an email and our team would assist you through the process. Thanks to +David Kutcher Who helped us in Developing this Gadget. IMPORTANT: To make Google plus and blogger comments appear together it is necessary that a post must have at least 1 comment. Those posts which have 0 comments would continue to display your default commenting system. Remember: (There is no need to Enable Google+ comments from your setting. If you have already enable it then disable it before you apply this tutorial). Awesome post bro now we have a chance to use both of them. thanks man. Syed bro i have off topic question. and alexa 109,430. and its improving daily. So now i am eligible for adsense should we apply for it or wait sometime. Secondly if i disapprove by adsense then we will never apply again or after sometime we have given a chance again. so guide me i am planing coming back..
can it place in web-site (not hosted by google) ?? i have checked your threaded comments posts but after apply thats we havnt child reply for several steps. thats was only two steps reply. so please send me your full comments coding i will change a little bit for my self. Hope you will do that for me. Well this system is heavily loaded and takes a long while to load (as its a new system). Therefore, by adding this to Mobile it would increase a lot of Load time. So keeping that in mind we excluded it from Mobile version. I am using a custom template and I am unable to click the B and G+ images can you plz help me. Yes What's your BLOG URL? Oh My God! That's actually a great trick you have shared. I was confused about adding Google comments on my blog but you just nailed it. Thanks!! I am going to try this on my blog! There is some problem with your custom theme! Please help me bro. Why the code is not work on my blog?? waiting for Google+ and Facebook together comment system. Its working. 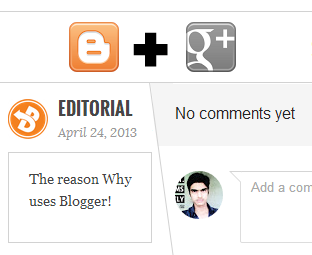 But the customization of blogger comment is disappearing when this trick is implement on the blog. works great !! but i have one question..how do you make Google+ comment to be the main section in this tutorial?? any idea?? How I can delete G+ commenting system and back using default comenting system? why we need a blogger comment? Kindly, upload the backup of the template that you took before applying this tutorial.